I refer to Sunday afternoon jam sessions as "Senior citizen's softball game for guys who aren't very athletic". This is the VFW at 33rd and Spenard. 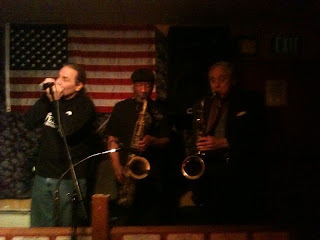 Steve on harmonica, Jim on tenor, and Ted (in his '70's) on tenor. I sat my tenor down so I could play with my new iphone camera, then mail the photo to myself. Then of course I didn't know what to do with the pic, so I put it here. When we have an entire horn section standing together, we look good. Who cares what we sound like. I didn't break it, but with others from O'Brien's Response Management, I got to work on the operation to get it Oliktok Point near Barrow, Ak. Had a great time in Seward, Alaska. Seward area firefighters put on a great conference.